We are both saddened and shocked to announce that our Lottie passed away early this morning. Until this discovery, Lottie had appeared to be fine, with no signs of discomfort or ailing health; her energy level had been up, her appetite normal, and she and Minnie had been relishing in the cooler fall temperatures lately, wandering and grazing the pastures. This morning while making her normal rounds, Samantha found Minnie in field 6 by herself, which is not at all out of the ordinary. After feeding Minnie, she carried on to look for Lottie, who was usually not far away. Sam checked all of Lottie’s normal hangouts, but kept a watchful eye on Minnie too, hoping that she would help by calling for Lottie with loud rumbles and bellows. But today was different. When Minnie finished eating, she wandered toward the front of the property, meeting up with Debbie and Ronnie at one of their new waterers and rendezvous areas. At that point, Scott joined the search too, and they continued on four-wheelers and on foot, looking in all of the valleys and crevices, in the creek beds and even unexplored hill tops. Eventually Minnie headed towards the back of the property again, grazing slowly just like any other day. When Scott entered field 7 on a four-wheeler, Minnie was grazing on the left side by the creek bed. Scott went along the right tree line, approaching previously explored areas but from a slightly different angle... when Lottie was finally spotted lying down behind some brushy growth under a giant cedar tree. This was the same tree Delhi could be found napping under in the chilly days of winter. A closer approach revealed a surreal image; Lottie was lying in an abnormal position, and with no sign of life. Minnie methodically grazed over towards Lottie's body, moving with a grace that suggested, "I know, and I am okay." When we asked Minnie to step away so we could examine Lottie, she did so willingly, standing just 20 yards to the side, giving us some time with Lottie to explore. The biggest struggle right now in losing Lottie is trying to determine what might have happened. There were not any signs of distress—it simply looks like Lottie collapsed and passed in an instant. Still without answers, we are all finding a little solace in the expression on Lottie's face; there is a peace beyond words. We are all in shock. Minnie may be as well, but for now she remains passive and calm, eating, drinking and socializing. While Minnie appears to be okay, she has lost her best friend and closest family, so we know that this will be a difficult journey forward. We’ll be there for her in every way we can, with a few extra treats or just to stand close by. The coincidence of this date Lottie chose to leave has also not escaped our thoughts today--October 10th was also Ned's birthday. Today is the first day of a new tomorrow, where Lottie has changed us all, and with her passing, we will all continue to grow in the shadow of her spirit. Our team of pathologists from the University of Georgia have scheduled a necropsy for Tuesday, and we are hopeful it will provide new information that will help us determine why Lottie left us so suddenly. Her grace and presence will be missed by all. We love you Lottie and miss your beautiful eyes already. As with so many other circus elephants, Lottie was captured from the wild at a young age, separated from her family herd and shipped to America to spend her life performing in circuses. Little is known about Lottie's early years, but records indicate in 1995 at the age of thirty, she was sold to the Hawthorn Corporation by California-based Circus Vargas, along with Minnie, Gypsy and Sue. 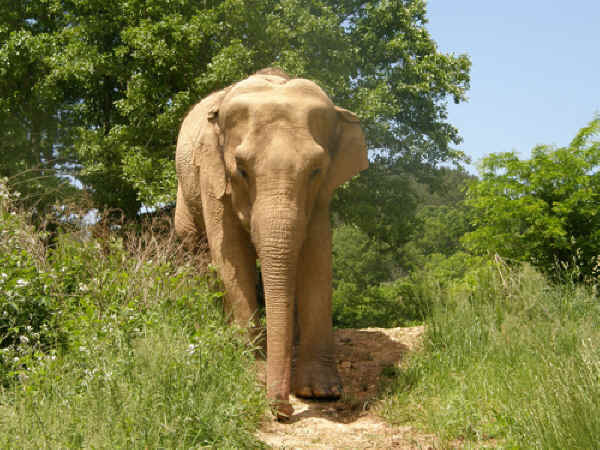 At 12:00 pm, on January 31, 2006, Lottie became the sixteenth resident of The Elephant Sanctuary in Tennessee arriving with her best friend Minnie. She was the second of eight circus elephants from the Hawthorn Corporation to make the 'Caravan to Freedom' trip. In their first weeks and months at the Sanctuary, Lottie became the self-appointed leader of her former circus herd (dubbed the 'Divas') and was instrumental in greeting and helping the later arrivals to adjust to their new freedom and surroundings. Lottie is typically very calm and serious, and spent most of her time with her best friend Minnie. In the beginning, it was not unusual for Lottie to slip off to an unexplored area of the habitat and bellow for her family to come join her. Of course, they would immediately respond to her request! Caregivers noted that over time Lottie became less serious and more playful, sometimes heading off to entertain herself with carefree abandonment in the wooded areas or the creek. As the Divas continued to adjust to their new life, Lottie's calm, relaxed nature made her a guiding force for her herd.